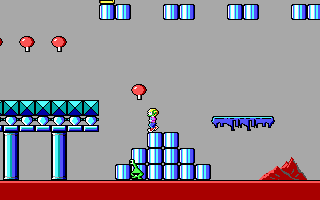 I have the Commander Keen CD collection that I bought from the 3Drealms online store. It contains episodes 1-5 of the Keen PC saga. Episodes 1 - 3 use the first version of the Keen engine that does not have any sound beyond the PC speaker. 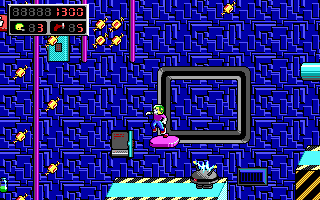 Episodes 4 and 5 use a newer engine that supports FM synth sound cards like the Adlib or Sound Blaster. 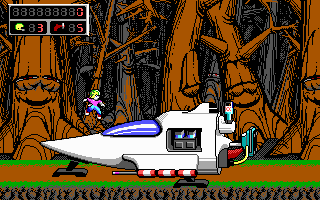 Both engines are 16 color EGA. But eposides 4 and 5 use a much better design and have more depth. Enough of the tech of the games. How do they play? Well, Keen is an 8 year old boy genius that ends of saving the planet from the Vorticons an evil alien race bent on Earth's destruction. Keen builds a ship called the Bean-With-Bacon Mega Rocket and Zooms off to save the day. 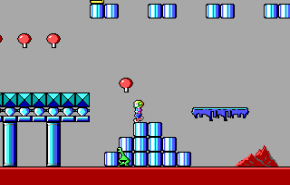 Keen is a basic side scrolling platform game. You can jump on some enemies, other enemies you need to shoot with a blaster. You have very limited ammo in the game, so you mostly do your best to avoid enemies. Lots of jumping puzzles and exploring large levels will be your forte here. I have a special place in my heart for Keen. The art reminds me of Warner Bros. style Duck Dodgers and Marvin the Martian. Keen wears a Green Bay Packer helmet as protection for his huge brain. Since I grew up in Wisconsin it appealed to me on some basic level. All in all a classic PC game and one of the first games I played on my old XT.